First, I want to say how much I appreciate your support of our talks series. All I can say, at a personal level, is how much I like the talks, myself. Just for starters, it gives me a wonderful chance to hear and meet people I might never have heard or met otherwise – and that includes you. One problem that we do have, however, is with Sell-Outs. That’s a happy problem to have in one sense – one that, by the very nature of things, we don’t always get but that we all devoutly want, including the speakers! But it’s not happy when, on the night, you see empty seats that had been booked for an event that, on paper, had sold-out. Seats that could so easily have gone to someone else who really wanted to come - someone on the waiting list, or even someone who had just shown up on the night, - had the holders simply let us know, if at all possible, in advance. We decided simply to try to copy the solution of others who have the same problem. And that is to ask those who book in advance to pay in advance (note: we can take payment over the phone! ), as well. And if they can’t come, to please let us know as much in advance as possible, and their money will be refunded. This way, with any luck, any empty seats would be more likely to be empty because the event, itself, was simply geared to more specialised interests. We do hope the new way of booking seats will make the same sense to you as it does to us. In addition, please know that, for most talks, booking isn’t essential. But as you can never tell when it might be, it is a safeguard. In any case, here’s hoping the new system works out better in future for all of us. One of the perks I value most about having a bookshop is that our talks series, such as it is (roughly a speaker a month between September – June) enables me to meet professionals in every field (the arts, sciences, even sports) who I would otherwise never have had the opportunity to meet. Some few are well-known to the public – hey! It´s a long way up here, the fee is risible, and the Old Waiting Room wherein the talks take place only holds 50 people tops (60 if they´re skinny). Still, some serious names (serious names with big hearts) have been willing to make the perilous journey above Watford, eg, Joanna Trollope, David Aaronovitch, Richard Ingrams, Anne Stevenson, James Fleming, Tony Harrison, and the late (loved) (missed!) Miles Kington. Alnwick, Corbridge, Hexham, Newcastle, Rothbury, Tynemouth, Warkworth, Wooler … Why were they built? Why were they built where they were built? Who built them? And what were they like? We have all visited them many times, but after this talk you will see them with fresh eyes and greater insight. Our speaker, Dr Richard Lomas, is the Emeritus Professor of History at Durham University, and an acknowledged expert on the history of the North East. His academic career also includes working with two American universities on their European Studies courses. Dr Lomas has lectured many times to capacity audiences at Barter Books on subjects as diverse as the Border Reivers, the Dukes of Northumberland, and the Vikings. He has also been called upon by such organisations as BBC Television, the RSC, and English Heritage for in-depth interviews, advice, and information about equally diverse subjects, such as the future of the Monarchy, medieval mystery plays, and the history of our county. His own publications include numerous articles in academic journals; books on the history of Northumberland and on the Percy family, as well as the comprehensive Encyclopaedia of North-East England. His newest book, due to be published in 2020, will be entitled Anglo-Normans in Ireland: 1169 – 1247. Date & Time: Monday, March 25th, 7.30pm. If you wish to receive mailshots regarding talks at Barter Books please send us your email address. If you wish to continue receiving mailshots regarding talks at Barter Books I will continue to send them. If your email address changes, please let me know. If you no longer wish to receive mailshots, please let me know and I will remove your name from our list of subscribers. The most recent programme is shown below. If you require further information, please contact Roger Jermy on 01665 606168. 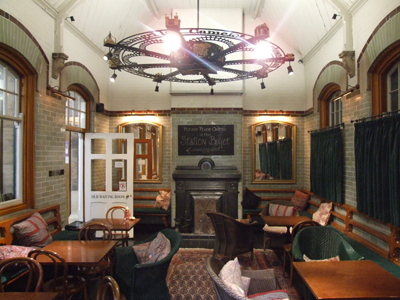 Meetings of the society are held in the Waiting Room, Alnwick Station at 7.00 pm for 7.30pm. They are open to members, their guests and visitors for a small donation towards costs. Refreshments will be available from 7.00 pm. “An evening with Pat Murphy”. Pat is the AVR's Civil Engineer and a noted photographer. He switches from being an audience member to speaker this evening to entertain us with some of his railway pictures. The annual quiz evening when the Aln Valley Railway team competes against the team from Gunnerton Railway Circle for “The Flat Bottomed Trophy”. The Barter Books Book Group meets once a month, 7-9, at the bookshop, and has actually grown into two groups, the Monday and Tuesday night groups, both of which read the same material. Its year is divided into two sessions, the Autumn session (September to December) and the Spring session (January to the end of May), with the reading for both sessions ranging over a wide range of choices, both classic and modern, fiction and nonfiction. The specific books to be read within that range are chosen by the leader (with an ear to suggestions from the group) according to a theme. The Book Club is led by Rosemary Hartill, a former BBC correspondent, who has reported from some thirty countries (including BBC World Service broadcasts). Among the radio series Rosemary has presented for the BBC are: Meridian Books (World Service books programme), Writers Revealed (fourteen interviews on Radio 4 with authors ranging from Iris Murdoch to Anthony Burgess), and Immortal Diamonds (a Radio 4 series about poets). The recipient of two honorary doctorates in literature, Rosemary has also written for the Guardian and the Times Educational Supplement and is the author of several books. 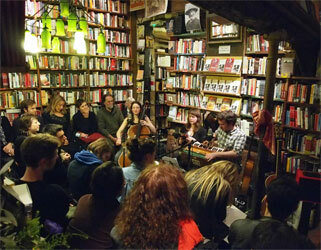 Two separate groups meet once a month in Barter Books, 7-9 pm – one group meets on a Monday, another on a Tuesday. 7 and 8 January: Portrait of the Artist as a Young Man This ends a few months before Ulysses begins and the latter was originally intended as a sequel to Portait although it developed into something far greater. 11 and 12 March: Setting sail. Ulysses, Episode 1 (Telemachus) 2 (Nestor) 3 (Proteus) 4 (Calypso) 5 (Lotus Eaters) 6 (Hades) (150 pages in total) In this first 150 pages we meet Stephen and his cronies in episodes 1-3 and then our other main characters Leopold and Molly Bllom in 4-6. Most of this is very readable narrative and dialogue, with some interior monologue. If you get lost in 1-3, jump to 4. Now... At the point, we can review how we are feeling, and possibly do two different things in the two bookgroups. One group might possibly like to divert to other books (choice to be confirmed). Others who want to stick with Ulysses can continue. Episodes 7-9 cover Bloom's movements around Dublin after the funeral and his lunch, and Stephen's discussions of Shakespeare in the National Library. We can use whatever resources suit us to fill in these episodes. Episode 10, Wandering Rocks introduces us to a selection of characters mostly new to us, so can be read without knowledge or 7-9. Episode 11 takes place in a bar and is very musical - reading aloud or listening to a talking book is recommended. Episode 12 includes 33 digressions in various styles and so is a challenging read, we may choose to leave for later. In 13 we are back on the beach with a parody of the sentimental romantic novel which is much more accessible, as a group of girls are watched by Leopold Bloom. But be warned the end of this episode got the book banned in the U.S. Episode 14, Oxen of the Sun, is possibly the most challenging of the whole book. 15, Circe, is much more fun as it is written as a stage play. We can dip into it if you have time but it is 140 pages long. Again, we can use whatever resources suit us to fill 14, 15 and 16. The Mahabharata, a shortened version by R.K. Narayan; and The Bhagavad Gita; Martin Bennett, West African Trickster Tales; Tennyson’s Morte d’Arthur (part); Anthony Price, Other Paths to Glory. Theme: INDEPENDENCE: Who We Are … and What We Can Be? Charles Dickens, Hard Times; John Lanchester, Whoops! :Why Everyone Owes Everyone and No One Can Pay; Bernard Shaw, Major Barbara; Polly Toynbee, Hard Work; The Gospel according to St Matthew. For all those who love gardens, Herterton Garden, created by Frank and Marjorie Lawley over a forty-year period on the Wallington estate near Cambo, is one of the truly outstanding gardens in England. Among many brilliant reviews, Robin Lane Fox, writing in the FT, called Herterton Garden quite simply “one of the most influential gardens to be created since the end of World War II”. 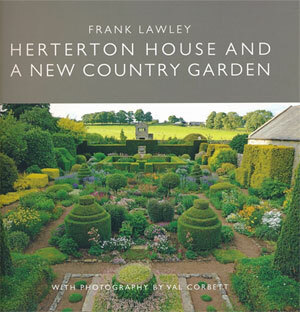 This book launch celebrates the new book, Herterton House and a New Country Garden, written by Frank Lawley and beautifully illustrated by Val Corbett. It recounts the story of two young artists who, virtually alone, slowly and meticulously restored over forty years what was basically a 16th century ruin of a house and embellished it with a garden worthy of it. The book is also a fascinating social history of a whole era on the Wallington estate (of which Marjorie Lawley’s father was the head gardener) along with fascinating asides on art and architecture. As important, maybe even more so, Frank and Marjorie did all this on no assurance, beyond the odd empty promise, that their garden would even survive. For all this and more, the well-known garden writer, Susie White, counts the book as unique among garden books as the life it describes – and a modern classic. Can you come to the book launch? We can’t promise you that there will still be seats left in the old Waiting Room, but we can promise you that we will do our best to make up for it with seating outside the Waiting Room, speakers so you can hear all the proceedings, plenty of wine and nibbles, compare garden notes with half the audience (including Frank Lawley, himself! ), see a little exhibition of Frank’s artwork as a young art teacher, and even meet the author, photographer, book designer, as well as two representatives from the book’s publisher, the much-esteemed Pimpernel Press. Most of all, and the whole point of the evening really, is just to have this chance to cheer on the lives of two people who have contributed so much to our own. 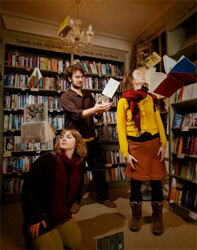 This Bath based trio, the Bookshop Band, will be playing at Barter Books on 16 June as part of their UK Tour, which ends up at the Edinburgh Literary Festival in August. 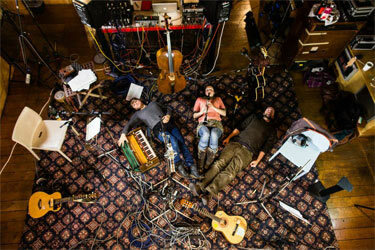 Their tour will also include Glastonbury Festival, Queen Elizabeth Hall, London, and WOMAD – The World's Festival. Playing keyboard, guitars, wind and strings, this versatile group specialise in writing and performing songs based on books! The event is free of charge, but if you like their music, they would greatly appreciate donations to help cover their expenses or even better, buy one of their CDs. With appearances on both Radio 4 and 6 and three years of touring behind them (Yes, they have done Shakespeare and Company in Paris!) they have built up quite a following, so don't miss this chance to catch them on this tour.